Coffee is meant to be enjoyed. Drink it the way you like it. 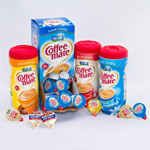 Choose from the most popular brands, Coffee Mate and Mini Moos. Whether powdered or liquid, non-dairy or half-and-half, regular or flavored, our creamers are shelf-stable and don’t require refrigeration. 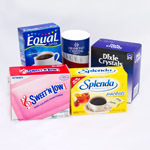 Whether you want real sugar or artificial sweeteners including Splenda, Equal, or Sweet n Low. We have them all in a variety of packages. 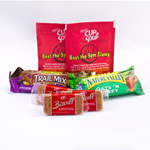 We have a variety of great snacks to choose from; Biscotti cookies to go with your morning coffee and for that afternoon break, Famous Amos Chocolate Chip Cookies, Nature Valley Oats N Honey and Trail Mix bars, Popcorn, etc. Do you like something not on our menu? Just ask and we will try to stock it for you! 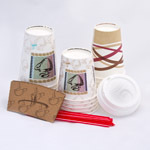 Paper or insulated foam cups in sizes ranging from 8oz. to 16oz. Water cups and stirrers available in different sizes as well.